The 3D version of UFC 143 will be a $10 premium over the HD version, which is a $10 premium over the SD version. 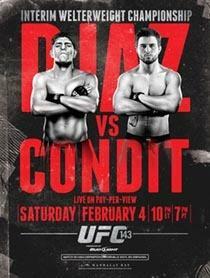 This weekend will be the debut of UFC's first 3D pay-per-view event. UFC 143 will let you enjoy matches like Kosheck vs. Pierce, Nelson vs. Werdum and Diaz vs. Condit in full 3D. The event will cost $64.99, a $10 step up from the HD version. Just after the UFC announced a 3D event, World Wrestling Entertainment started looking into 3D event plans of its own. The WWE won't have 3D ready for April's Wrestlemania, but is instead looking forward to a possible 3D broadcast of Summerslam.